94. How are mast cells involved in cancer? Mast cells are very involved in cancer biology. They are frequently found in tumors. Tumors can trick mast cells into doing things they need to stay alive, like make blood vessels to supply the tumor with blood, and tissue remodeling, to push aside the healthy tissue and make room for the tumor. Cancer is mast cell activating. All cancers. This is because cancers often trick the body into doing things that help the cancer and not the body, like I just described above. Having cancer frequently causes allergy symptoms because of mast cell activation. Cancer can also cause the body to make more mast cells than normal, a condition called mast cell hyperplasia. This can happen because the body is trying to fight off the cancer with more immune cells or because it has been tricked by the cancer to make more mast cells to help the cancer. Please note that mast cell hyperplasia is NOT the same as mastocytosis. Mast cell hyperplasia is too many healthy mast cells that function normally. Mastocytosis is too many aberrant mast cells that do not function normally. Cancer does not cause mastocytosis. Long term inflammation increases future risk of cancer at the site of inflammation. This applies almost universally. Mast cells participate significantly in inflammation so they can contribute to the risk of cancer. For example, patients with long term colon inflammation, which may be caused by mast cells, are at increased risk of colon cancer. Patients with mastocytosis have increased risk of developing cancer, especially those with systemic mastocytosis. As many as 40% of patients with systemic mastocytosis develop another blood disorder with too many broken cells. Frequently, the other blood disorder is a blood cancer like chronic myelogenous leukemia. It is not yet known if mast cell activation carries an increased risk of developing cancer. Two forms of systemic mastocytosis are cancerous, mast cell leukemia and mast cell sarcoma. These are both extremely rare and it is extremely rare for a person with a history of mast cell disease to develop either of these conditions. My name is Lisa Klimas. 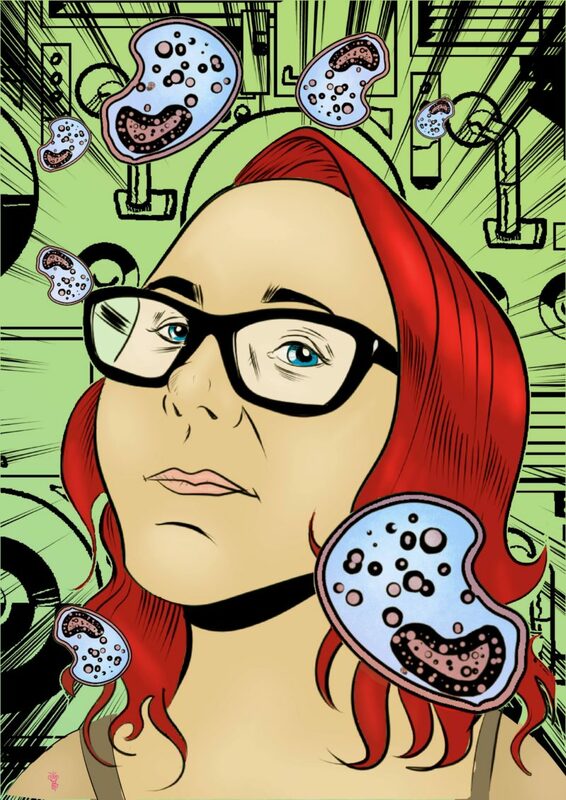 I am a 34 year old research scientist and a subject matter expert in mast cell diseases. I have a rare blood disorder called systemic mastocytosis. The hallmark of mast cell disease is severe allergic reactions or anaphylaxis to things we’re not actually allergic to. Constant mast cell activation can affect every system in the body. Organ damage from inflammation is not unusual. I myself have had significant organ damage, most specifically in my GI tract. Additionally, mast cell reactions and anaphylaxis can occur at any time and without warning. Living with this disease is unpredictable in the extreme. Mast cell activation under a variety of circumstances has been linked to pain. I have pain. I have bone pain in the legs and pelvis. I have costochondroitis that keeps me awake. I have significant GI pain. My stomach is paralyzed. My colon is heavily damaged and has been operated on twice. I had a colostomy for over two years. My colon has herniated multiple times. I deal every day with the consequences of this disease. I deal every day with the pain it causes me and will always cause me. Since pain is part of my life, so is pain medication. Since pain medication is part of my life, so is abuse and judgment by providers I don’t know. It is so prevalent and requires so much energy that mistreatment by health care professionals is almost a symptom of this disease. Every good story has an antagonist. You need someone to root for and someone to despise in order to drive the narrative. This also plays out in real life. Shared disdain provides a reassuring connection to others who share your views. There is always a good guy and a bad guy. And in the story that the healthcare establishment tells itself, patients who need pain meds are the antagonists. We are the bad guys. Healthcare providers often feel that it is not just allowed, but expected, that patients in need of pain medication are treated as if they were seeking these medications for recreational use. We know those people exist. But we are not those people. We are people who are damaged and hurting. Pain is crushing. It takes so much from you. It takes things from you that you can never get back. For many of us, the only way to control the pain is with narcotics. We have legitimate medical needs for pain management medications. We do not get high from them. We do not enjoy them. For many of us, pain medication is the difference between functioning and not. We are just trying to live our lives to the best of our ability and pain medication makes that possible. Please recognize this situation for what it is. Please stop conflating pain patients with drug addicts. We are not scamming you. We are coming to you for help. Please treat us the way you would treat anyone else who came to you for help. This story you are telling yourself is wrong. We are not your enemies. We are not antagonists. We are people. Help us.